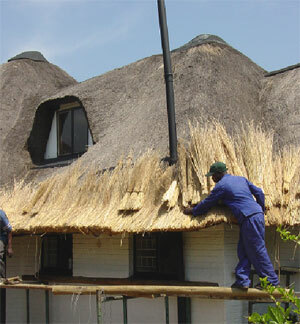 Early maintenance not only protects your thatch but also improves the lifespan of your asset. Early maintenance ensures good water rundown that reduces thatch decay. Decaying occurs when water run-off is restricted in any manner. Periodical expert brushing of thatch evens out the thatch to improve water run down and run off. Proper brushing increases the thatch life and prolongs the time line of a thatch. A service certificate is issued by Buildup on completion of the maintenance to insurance requirement as proof in an event of a claim. Avoid disappointment of insurance claims not being approved as a result of not having certified maintenance and thatch fireproofing done. Build up’s experienced team will assess the roof as a whole and give special preventive attentions to sections and areas that could give costly future problems. Bring down the cost of future maintenance by servicing your roof. BUILDUP THATCH & HOME is a Thatch seal applicator and complies with the DIN 4102 part 7 (fire behaviour of building material and building components for roof coatings)-STM 182-1979 (burning characteristics after 2000 hours weathering) and is compliant to the CI TT2 Fire Code.